That Sunday evening my young grandfather, Mbah Mardi accompanied me to Pasar Johar. He met me up with his broter-in-law and sister-in-law who usually sell clothes in Pasar Johar. Mbah Mardi has married with a woman who was oldest daughter of the family. That women had no father. At the time that woman just lived with her mother and his brothers and sisters. So, after married with her Mbah Mardi had replacing role of fahter in that family. 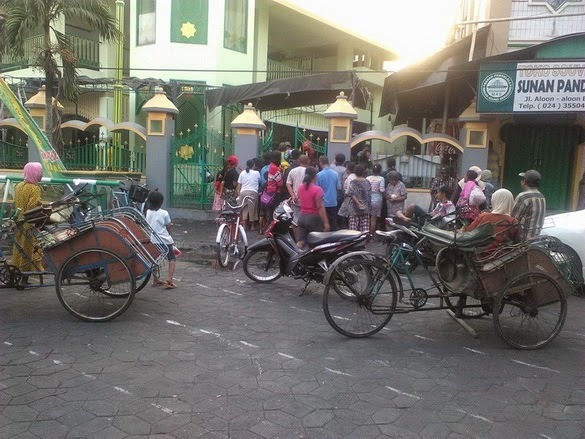 In that evening, Mbah Mardi and me met them, his brother-in-law and sister-in-law in Pasar Johar. It looked like father met their children. He introduced me to them. After all, me and Mbah Mardi sparated. He saw me the way to Trend Store to buy something new. Before had gone to the store, i prayed in Masjid Agung Kauman. There was crowd. People reached Eid committee room to scramble sacrificial meat. There was an old man who was indicated had taken double bags of meat. Two committee and himself involved in bicker. And there were so many woman was waiting for meet. The last time i saw situation like that was six years ago. That was little bit crazy i thought. Then, i had walking to Trend Store where located 50 meters from mosque. Then, i was out from store and looked for ATM machine, through masque again. 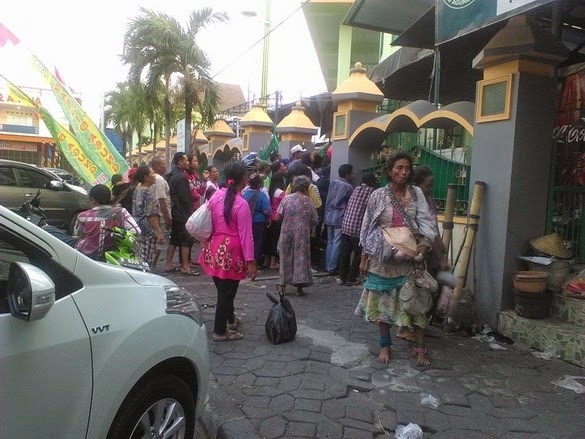 It was 5.30 pm and people still waiting in front of mosque, now committee didn't allow them to entrance the gate of mosque, but they urged. There was an old women whom i watched carefully, she wore no sandals and brought some bags and shawl. I thought she waited for meat too. I didn't know. I tried approached her to know if she sold some snacks of what, i just felt moved. But when i approached her she just sat and doing nothing. That was my Eid Day. That was a gift of Eid Day, people could integrated and they were given by others. Damn full english... i don's celebrate Idul Adha this year because i stay at city where moslem are minority. Aisyah, lama tak bjumpa. Sudah sama amir saja. hahaha. Yandhi, kamu di Manado yak?